New 3rd Edition now in stores! Surf-soaked beaches, swaying palms and the sound of the slack-key guitar – there is no cruising paradise quite like Hawaii. 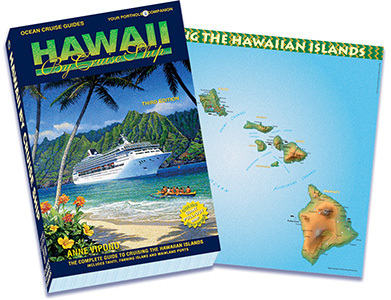 Includes insider tips on selecting and preparing for your Hawaii cruise. 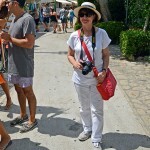 Over 400 color photographs and dozens of maps support the narrative of this exciting cruise. Covers all major islands and ports with pre and post suggestions for hotels on Oahu and Maui and detail shore excursion information. Also includes large (16 by 19 inch) color pull-out map. This isn’t a guidebook that was slapped together to get in on the relatively new Hawaiian cruise experience. The guide is well-thought out, well researched and beautifully executed. It’s as good a guidebook as I’ve seen. Not only do you get the meat-and-potatoes information on the islands but you also get the exotic desserts, as well. These books (by Anne Vipond) should be considered high priority. Vipond, an accomplished travel writer, offers in-depth histories of each region, descriptions of the ships that sail there, and suggestions on what to see at each port, all complemented by a large pull-out map. A core resource for libraries. Logistics can be a nightmare but not if your’re packing Anne Vipond’s Hawaii By Cruise Ship cruise guide book to these islands. It outlines history and culture that make Hawaii unique among states but also details the best shore excursions. Includes useful island maps which pinpoint attractions. For cruisers with limited time on each island, this book is a recommended guide to enjoy the spectacular coastal scenes that land-based tourists rarely see. I’m taking my family on a Hawaiian Cruise aboard the Pride of Hawaii this month. Even though I’ve been selling Hawaii forever, I have found this book to be an invaluable resource for anyone planning a cruise to Hawaii. If you only have a day or two in each port of call, you can really struggle with picking the right excursions or validating the one’s you may have already picked. This is like a Bible for anyone cruising to Hawaii.